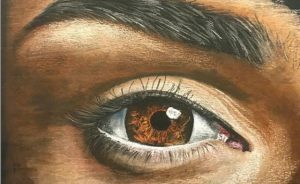 If you’ve been to Lost Rhino Brewing Company in the past seven years or so you have, no doubt, been introduced to the captivating art of Tonia Priolo. 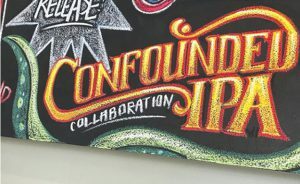 Upon entering the popular tasting room in Ashburn, the first thing customers see is the draft board with colorful illustrations for each of the beer offerings. Elsewhere around the brewery, oversized portraits, movie-themed event boards; and special event announcements are on display. High on one wall, Napoleon Dynamite’s portrait draws attention to the upcoming live music lineup. 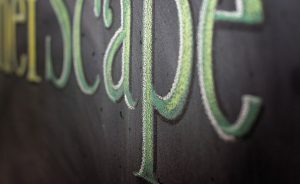 Some of the blackboards are bright and playful, others dark and soulful. All are created in chalk. 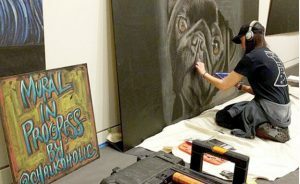 Priolo, known around the area and on social media by her moniker, “Chalkoholic,” has been drawn to art since childhood. Her favorite Christmas gift was always Crayola crayons. “My mom let me draw on the wallpaper in my bedroom,” she said. “I remember drawing a giant kangaroo and a mountain lion with crayons and colored pencils.” In middle school and high school art classes she used pastels. It was much later, working for a brewpub that needed large menu boards designed for a festival, when her love affair with chalk took hold. 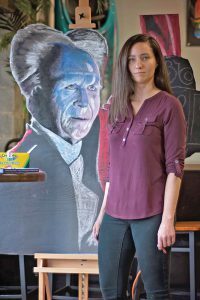 “I realized how much I loved working with chalk and how much people enjoyed the artwork,” she said. It was fun to use her lifelong passion for art at her job, even if it meant designing only menu boards from time to time. After five years there, then eight years of being home with her kids, Priolo was going through major changes in her life and needed to take on some outside work. She had enjoyed the fun atmosphere of the brewing industry, so she started by looking there. As luck would have it, Lost Rhino had advertised that they needed some chalkboards done. “I went there with my tiny portfolio and got the job to do some artwork for them,” she said. “A month later, they expanded their hours and I found myself working there full-time, doing chalk art and helping to manage the tasting room.” Almost seven years and more than 1,000 chalkboards later, Priolo’s style has become an integral facet of the brewery’s brand identity. One recent work that’s getting much attention is a mural (in paint, not chalk) on the wall of the dining room at Ashburn’s Buffalo Wing Factory. The mural depicts a row of beer taps, each with a different glass of local craft beer beneath it. The painting is extremely realistic. 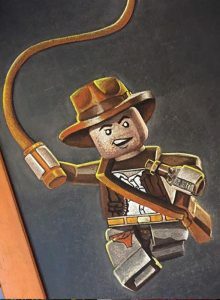 “So many times we have had guests stop on their way in or out of the restaurant to check out the mural, often going up to touch it because the ‘wood’ frame looks so real,” Nikki Sicilian, the restaurant’s director of communication and public relations said. “She was so committed to getting this project perfect we even went to the breweries to get photos of the beers in their proper glassware.” Sicilian admitted that particular field trip for research and development was not a painful one. Restaurants like the Buffalo Wing Factory can buy wall art from anywhere to decorate their walls. But to collaborate with a local artist to create something utterly original is more meaningful to customers and staff alike. Just as people desire quality local beer, they enjoy the connection with local art as well. Instagram has opened unexpected doors for Priolo. She was contacted by a professional skateboarder in L.A. who wanted her to do some artwork for his company’s social media outreach. Having been a part of the skateboarding community since she was a kid, she was understandably ‘stoked’ to do work for them. Watching Chalkoholic at work is mesmerizing. Working mostly on textured plywood that she paints with chalkboard paint, she builds layers upon layers of colors that might not seem right at first but blend perfectly on the board. Details, highlights, shadows, all unfold before your eyes. Music is a major component of the creative process for Priolo, helping her focus during those long live sessions as well as when she’s working alone. If she has chalk in her hand and a board in front of her, her signature Bose headphones are sure to be on her head. “Listening to music during a project not only provides me with a certain kind of creative energy while I’m drawing, but also helps to basically transport me into a working zone that can last for hours,” she said. “It allows me to be fully emerged into my work without any distractions.” Her music of choice: punk rock. Chalk by nature is not a permanent medium. Undoubtedly, many of her signature pieces will stand the test of time, whether hanging on a wall out of reach, or fixed with a sealer (Priolo is always experimenting with materials and methods of preservation). But inevitably, some work is erased to make room for something new.